Mouse anti Human CD289 antibody, clone 5G5 (MCA2265) used for the evaluation of TLR9 expression in canine polynoprphonuclear leukocytes using flow cytometry. Percentage of TLR positive PMNs in different disease categories. Boxes contain values from the 1st to the 3rd quartile, lines inside boxes indicate median values, endpoints of vertical lines display the 5th to 95th percentile and · represent the outliers. Asterisks indicate statistically significant differences (* P <0.05; ** P <0.01; *** P <0.005). BM, bacterial meningitis; CSF, cerebrospinal fluid; Healthy, healthy dogs; Mix, miscellaneous diseases of the nervous system; MUE, meningoencephalitis of unknown etiology; PB, peripheral blood; PMNs, polymorphonuclear cells; Pyo, pyogenic infection; SRMA, steroid-responsive meningitis-arteritis; SRMA A, SRMA Acute; SRMA Th, SRMA under therapy; TLR, Toll-like receptor. From: Maiolini A, Carlson R, Tipold A. Toll-like receptors 4 and 9 are responsible for the maintenance of the inflammatory reaction in canine steroid-responsive meningitis-arteritis, a large animal model for neutrophilic meningitis. J Neuroinflammation. 2012 Sep 27;9:226. Mouse anti Human CD289 antibody, clone 5G5 (MCA2265) used for the evaluation of TLR9 expression in canine lymphocytes using flow cytometry. 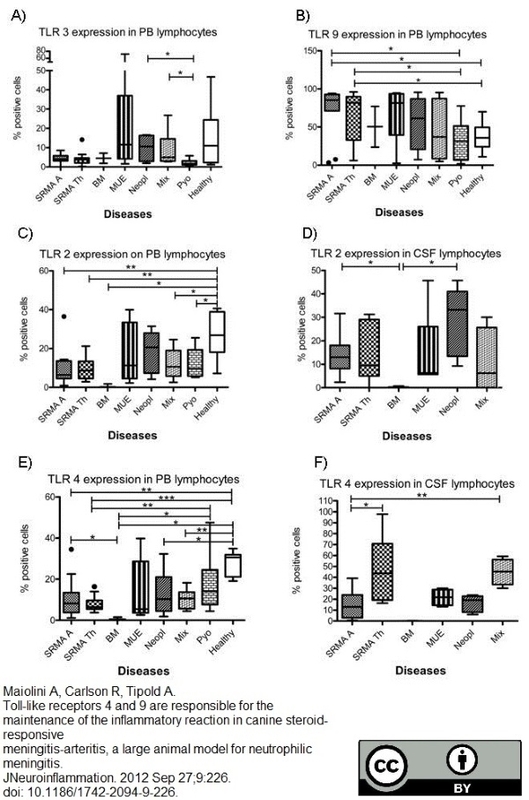 Percentage of TLR positive lymphocytes in different disease categories. Boxes contain values from the 1st to the 3rd quartile, lines inside boxes indicate median values, endpoints of vertical lines display the 5th to 95th percentile and · represents the outliers. Asterisks indicate statistically significant differences (* P <0.05; ** P <0.01; *** P <0.005) BM, bacterial meningitis; CSF, cerebrospinal fluid; Healthy, healthy dogs; Mix, miscellaneous diseases of the nervous system; MUE, meningoencephalitis of unknown etiology; PB, peripheral blood; PMNs, polymorphonuclear cells; Pyo, pyogenic infection; SRMA, steroid-responsive meningitis-arteritis; SRMA A, SRMA Acute; SRMA Th, SRMA under therapy; TLR, Toll-like receptor. Mouse anti Human CD289 antibody, clone 5G5 (MCA2265) used for the evaluation of TLR9 expression in canine monocytes using flow cytometry. 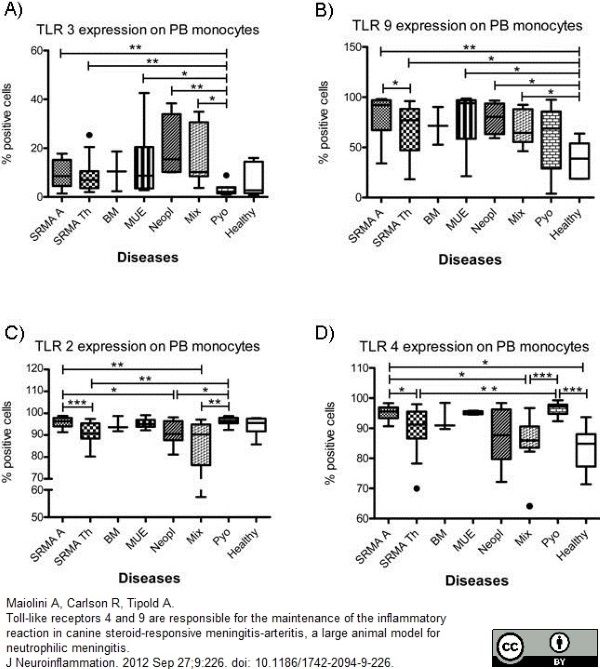 Precentage of TLR positive monocytes in different disease categories. Boxes contain values from the 1st to the 3rd quartile, lines inside boxes indicate median values, endpoints of vertical lines display the 5th to 95th percentile and · represents the outliers. Asterisks indicate statistically significant differences (* P <0.05; ** P <0.01; *** P <0.005). BM, bacterial meningitis; CSF, cerebrospinal fluid; Healthy, healthy dogs; Mix, miscellaneous diseases of the nervous system; MUE, meningoencephalitis of unknown etiology; PB, peripheral blood; PMNs, polymorphonuclear cells; Pyo, pyogenic infection; SRMA, steroid-responsive meningitis-arteritis; SRMA A, SRMA Acute; SRMA Th, SRMA under therapy; TLR, Toll-like receptor. From: Maiolini A, Carlson R, Tipold A.
Toll-like receptors 4 and 9 are responsible for the maintenance of the inflammatory reaction in canine steroid-responsive meningitis-arteritis, a large animal model for neutrophilic meningitis. Mouse anti Human CD289 antibody, clone 5G5 recognizes human, canine and murine TLR9, otherwise known as CD289. TLR9 is a member of the Toll-like receptor (TLR) family and functions as a receptor for bacterial DNA (CpG-DNA), playing a fundamental role in pathogen recognition and activation of innate immunity. In mouse RAW264 cells TLR9 has been shown to be expressed intracellularly, but not at the cell surface. Fusion protein of human TLR9 (amino acids 1-815). MCA2265 detects a band of approximately 170-180 kDa in RAW264 cell lysates. Ahmad-Nejad, P. et al. (2002) Bacterial CpG-DNA and lipopolysaccharides activate Toll-like receptors at distinct cellular compartments. Eur J Immunol. 32 (7): 1958-68. Batsford, S. et al. (2011) Protein level expression of Toll-like receptors 2, 4 and 9 in renal disease. Nephrol Dial Transplant. 26 (4): 1413-6.